NIT Silchar Recruitment 2019 -The National Institute of Technology, Silchar (NIT Silchar) invites applications in prescribed format from Indian Nationals possessing consistently good academic record and requisite qualifications and experience for the following posts. Master’s Degree in Library Science/ Information Science/Documentation with CGPA of 6.5 in 10 points scale or at least 60% of the marks or its equivalent grade of ‘B’. in the UGC seven point scale and a consistently good academic record. Qualifying in the national level test such as NET / SLET / SET conducted for the purposed by the UGC or any other agency approved by the UGC. Master’s degree in any discipline with at least 55% marks or its equivalent Grade in the CGPA / UGC point scale with good academic record from a recognized University / Institute. First Class Bachelor’s Degree in Physical Education from a recognized University or Institution. Knowledge of Computer applications viz., Word processing, Spread Sheet. Senior secondary (10+2) from a recognized board with a minimum Typing speed of 35 w p m. and proficiency in Computer Word Processing and Spread sheet. The eligible candidates have to apply in the prescribed format of the application form and the data sheet can be downloaded from NIT Silchar website (www.nits.ac.in). The hard copy of the application should preferably be sent through speed post to “The Registrar, National Institute of Technology Silchar, P.O. 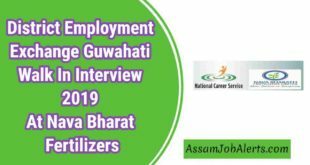 Silchar – 788010, Assam” on or before 15 days from the date of publication of this advertisement in Employment News [Issue no 52, 30 March-5 April 2019] up to 1700 hours. The application fee should be paid directly to State Bank of India A/C No. – 10521277057, IFSC Code – SBIN0007061 of Director, NIT Silchar.